Hanuman is a favorite and powerful God in the Hindu religion. Lord Hanuman is money and he fought famous wars with the great king named Ravana. 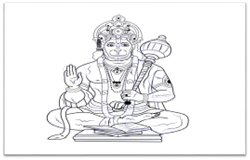 There are many techniques and tricks available to draw Hanuman pencil drawing, but the best set of procedures make the drawing successful. If you want to draw Lord Hanuman face and full body drawing, you can learn the simple steps to complete the drawing properly. Along with this, you can spend more time and pay more attention while sketching the Hanuman drawing. It involves many steps, the same the case with Lord Shiva Drawing and Lord Ganesha Drawing but Drawmanager.com make it very simple and easy. The following steps not only simply the drawing task, but it also helps you to complete the drawing as soon as possible. At first, you can draw a proper oval shape and create a perfect structure or outline for the upper portion of Hanuman drawing. It is vital to note that drawing Hanuman image is a time-consuming process, so you can spend enough time to sketch your drawing. You can prefer light lines until completing the Hanuman drawing. In this step, you can properly draw the outlines for hands, legs and arms of Hanuman. These are the basics of drawing an image, so you can use these things in a proper manner. Now in this step, you can draw the outlines for book, table, and weapon. You can take measurements carefully to create a highly accurate Hanuman drawing. It is one of the most important steps that let you draw the outlines for nose and eyes of Hanuman drawing. You can give more importance to each and every detail of your Hanuman drawing. You have the draw everything by using a pencil because it helps you to draw light lines that can be erasable easily. The precise measurements make the outlines accurate. Now, you can draw the most accurate outlines for Hanuman lips. In order to create the outlines, you need to pay more attention. In this step, you can properly draw the outlines for the lower face of Hanuman drawing. Along with this, you can also draw the outline for the crown. If you face any difficulties while creating the outline, you can refer the above diagrams that bring you a clear idea about this step. Once you have drawn the outlines, you can start to sketch designs in your drawing. After that, you can sketch out the outline for Hanuman face. Now in this step, you can draw the fingers, hands and arms of Hanuman drawing. While drawing these details, you need to widen the curves for drawing the picture in a precise manner. After that, you can draw the weapon properly. While drawing the weapon, you can include the design in it. It is another important step that plays a vital role in drawing Hanuman image. In this step, you can draw the belt for Hanuman. You have to spend some time and put your entire concentration in drawing to make your Hanuman drawing looks great and precise. After that, you can draw the lower body suit. Additionally, you can also draw the ribbon. And then, you can enhance your drawing as clearly shown in the above diagram. In this step, you can also draw and highlight the table as well as the book. Drawing the retinas is an essential step in drawing Hanuman image, so you can give more attention to this step. You can draw the locked and enhance the weapon. Additionally, you can also draw bangle and enhance crown. Now, you can draw next locket and enhance the image as shown above. Finally, you can make all essential improvements in order to finish Hanuman drawing in a proper manner. I hope you like reading above article on “ How to Draw Hanuman pencil sketch cartoon step by step”.